MANILA — The Department of National Defense (DND) confirmed plans to acquire 24 brand-new attack helicopters which will be used by the military to support troops engage in fighting terrorists and other lawless elements. “We have programmed procurement of 24 attack helicopters under the Second Horizon of the Revised Armed Forces of the Philippines Modernization Program. We are awaiting for the final approval of the Office of the President on the RAFPMP Second Horizon,” he added. However, the project still has no “ABC” (approved budget for contract) as of this posting, Andolong pointed out. Is the numbers of being purchase different from the AFP Modernization under PNoy? Everything that PNoy bought was really “under” Arroyo. All that Presidents really do is give broad direction and funding. At the end of the day, its the AFP that should be thanked for these acquisitions. The Armed Forces of the Philippines will not receive the new attack helicopters President Rodrigo Duterte promised and mentioned before soldiers on Wednesday before a year or two, the Department of National Defense said on Thursday. Arsenio Andolong, the public affairs chief of the DND, said the department had been discussing the procurement of the aircraft as early as October last year but added that their procurement and delivery would take time. “Naku, matagal tagal pa ‘yun. Usually, kapag brand new aabutin din ng taon ‘yan e. At the most siguro two years ang estimate ko. Usually ‘yun ang mga delivery time ng mga weapon systems natin,” Andolong said. Under Arroyo? Did not hear any modernization during GMA’s term. Only know about it during Ramos term, then Aquino. Even during the Timawa forum years, only under PNoy. Just glad the modernization is still continuing. even all the WHECs, the polish helo's, the fa-50's? The W-3s were awarded their IETB in 2009. The WHECs were initiated in Arroyo's time as well, but the final two boats were selected in PNoy's time. The FA-50 actually traced its roots to the Ramos years with the SAA project. It eventually merged with the LIFT project during PNoy . . . c/o of the DSOM process that was initiated during Arroyo. PNoy had a golden opportunity to get a whole lot of things done during time. But he choose, instead, to reset everything, fire all experienced procurement professionals that could completed acquisitions in a timely manner and wasted 5 years. as much as i didnt like him being president, i thought he did very well in arms acquisition. i knew the first WHEC was arroyo's and i thought the other 2 was his initiative. so as the whole fa-50 package, the aw-109's, the BRP tarlac, the W3's, the pohang and the incheon (when delivered). what acquisition did he miss? i thought mamapasano was the only miitary/police failure he got. forgive my ignorance. thank u for the reply(s). did he just got the glory in modernizing of the AFP? As stated earlier, the W-3 was not PNoy. 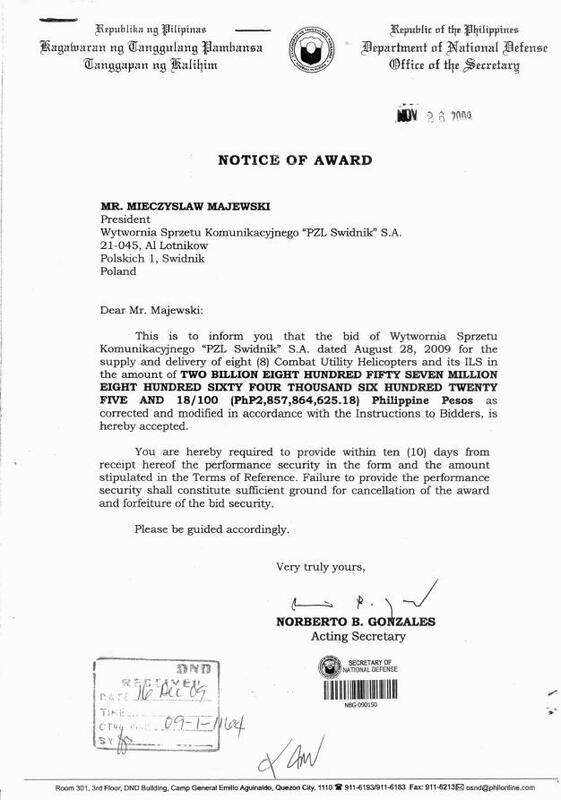 The Notice of Award was actually issued in 2009 by Norberto Gonzales, Arroyo's final SND. These were accepted during PNoy's time, but he then he acquired yet another CUH in the form of the Bell 412, which now puts the future of the W-3 in doubt. PNoy's problems lay in the fact that he nuked the DND acquisition staff when he entered office. While there were problematic acquisition professionals in the DND (including the "patron saint of failed bidders"), instead of being thoughtful about which officials to fire and which ones to retain, he just cleaned house. Threw the baby with the bathwater, and wiped out any institutional knowledge that existing in the DND. Contrast this with Duterte's current approach of reducing disruptions to ensure continuity. That knowledge is actually the foundation for whatever PNoy eventually bought. But without the original people who actually did the work . . . this led to glacially slow pace of acquisitions that resulted on projects only being completed either in the final weeks of PNoy's term instead of mid-stream. All because his people didn't know what they were doing, and completely missed the lessons learned working with the GPPB. Thanks to the Defense System of Management (DSOM), the drafting of policies that gave the AFP access to Malampaya funding for acquisitions, and completion of guidelines for the crafting of Multi-Year Obligational Authority (MYOA) -- all of which were Arroyo era developments that PNoy's staff had no clue how to use -- a whole slew of projects could have been completed much much early. Looong before China change the situation on the ground with its island building. The poster child for how inexperienced staff can fumble a touch down was the Maestrale deal. The ship was chosen. The deal was in the offing. 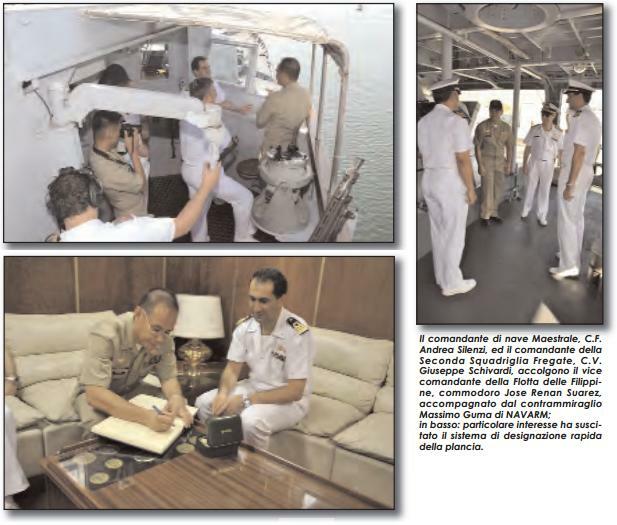 Then a bad decision with regard to the selection of the USCGC Dallas, which was bought without an engine hence a delay of more than a year, soured PNoy's rookie staff on the idea of 2nd-hand equipment. Again . . . baby with the bathwater . . . bye-bye Maestrale. (Other rumors of lobbying are hard to validate, so I will leave those off the discussion). Now the Frigate purchase is in Duterte's hands, and those reportedly isn't slated to arrive any sooner than 2020. The image below could have been a reality long before 2016. The following article shows how close we got. 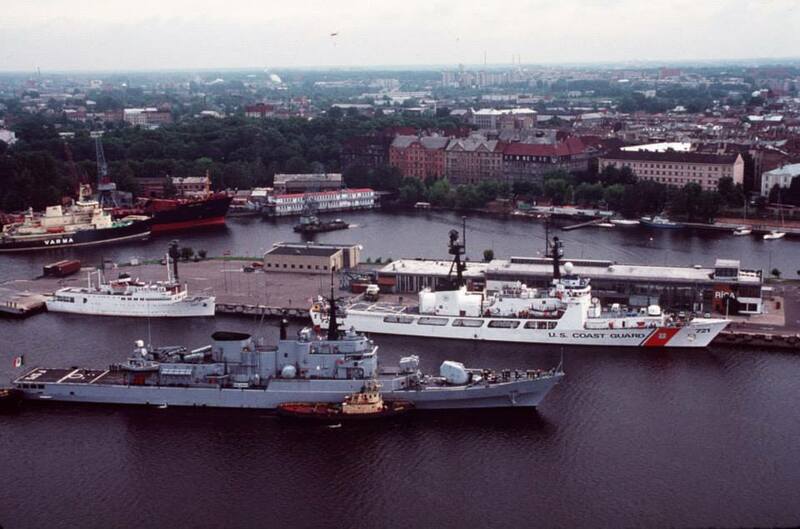 VADM Pama even went so far as to confirm to Congress that a ship had already been selected. Remember the failed Fennec attack helicopter acquisition that DND officials simply couldn't close because they couldn't explain to the GPPB how the regulations worked out in the past administration would have justified their acquisition? A lot of things happened during the PNoy administration. But not nearly as much as could have been achieved had his staff knew what they were doing and leveraged the tools that DND staff of the previous administration had already figured out. Any confirmed ABC for this project? And also, Duterte has mentioned the term "gunships" in several occasion. Will this project be an acquisition of bonafide gunships or just "battle-taxi" as usual? House Appropriations Committee chair Karlo Nograles said that the P25-billion Armed Forces of the Philippines (AFP) modernization program will improve the military's fighting capabilities in all aspects. In a news release, Nograles said the Department of National Defense has already given final approval of the details of the P25 billion for the modernization plan. "We're talking about land, air, and sea upgrades for the AFP. This modernization program will erase doubts regarding the Duterte administration's commitment to our brave men and women in uniform and protecting the country as a whole," Nograles said. "While our military personnel will no doubt enjoy their well-deserved increase in base pay this year, their morale will get another huge boost thanks to the new combat vehicles they will be getting," he added. Included in the forthcoming purchases under the modernization plan are 24 attack helicopters worth P13.8 billion, one fixed wing jet worth P2 billion, and one turboprop patrol aircraft worth P1.8 billion. "If the acquisition of the attack helicopters will be subject to a multi-year acquisition, then the list would also include 44 units of light attack tanks. These will be worth P9.4 billion," Nograles said. The program will also include payment, through multi-year obligations, for two frigates, an amphibious assault vehicle, and a surveillance radar worth a total of P8 billion. PARIS — Airbus Helicopters has announced a successful test-firing campaign of 70mm laser-guided rockets from its H145M helicopter. The rocket tests, which were conducted in early December but announced Jan. 31, are part of the company’s development of its HForce weapons packages meant for military services looking to arm rotorcraft. The tests were conducted at the Alvaden test range in Sweden, with the Thales FZ275 LGR, which stands for laser-guided rocket, and an MX-15D electro-optical system from L3 Wescam, according to Airbus. The rockets are intended to deliver a precision strike, which seeks to limit civilians casualties, particularly in asymmetric combat. Airbus Helicopters has outlined plans to substantially expand its share of the Asia-Pacific military helicopters market. Speaking at the 2018 Singapore Airshow on 8 February, Fabrice Rochereau, the company’s head of sales for Southeast Asia, said that Airbus Helicopters currently holds nearly 10% of the regional military helicopter market but within 10 years it aims to hold up to 40% of market share. A major platform supporting the company’s regional expansion plans, he said, is its H145M light utility twin-engine helicopter, a variant of the H145 civil helicopter. Airbus Helicopters said that as of 2017 about 9,000 helicopters were flying the Asia Pacific, with 5,000 in the civilian/paramilitary sector and 4,000 in the military sector. Airbus Helicopters said it leads the Asia-Pacific civilian/paramilitary sector with a 40% market share. Rochereau said that one of the main reasons for the lower market share in the military segment is the strong regional presence of Russian platforms, particularly the Mil Mi-17 ('Hip') transport/utility helicopter. However, he added that Airbus Helicopters’ share in some countries – particularly Australia and New Zealand – was much stronger than the overall figure. Rochereau did not elaborate on potential customers but did confirm that the company is bidding for contracts in the Philippines. Jane’s understands that the aircraft is positioned to meet a Philippine Air Force (PAF) requirement for a fleet of night-capable attack helicopters. 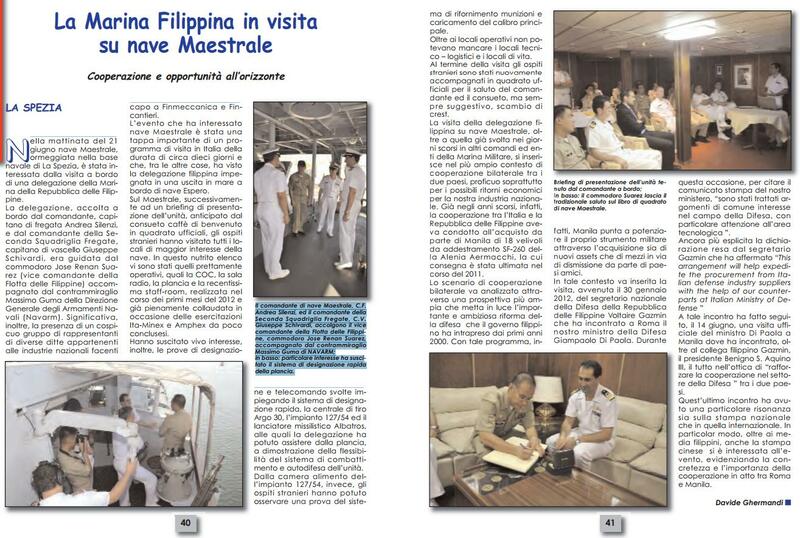 Future opportunities for the platform may also emerge with the Philippine Navy (PN) and Philippines Coast Guard (PCG).